Beautiful lines and composition in this monochrome. Well done. You tell a simple story in this strong image. Reflections often show up better in black and white. Great photo. I like it very much, nice black and white ! Would certainly make a challenging jigsaw puzzle. Boston in a vanishing point. She is more interested in her phone than you, all to the good. great composition and a sharp reflection emphasised by monochrome but a modern image seen all over in this mobile age. 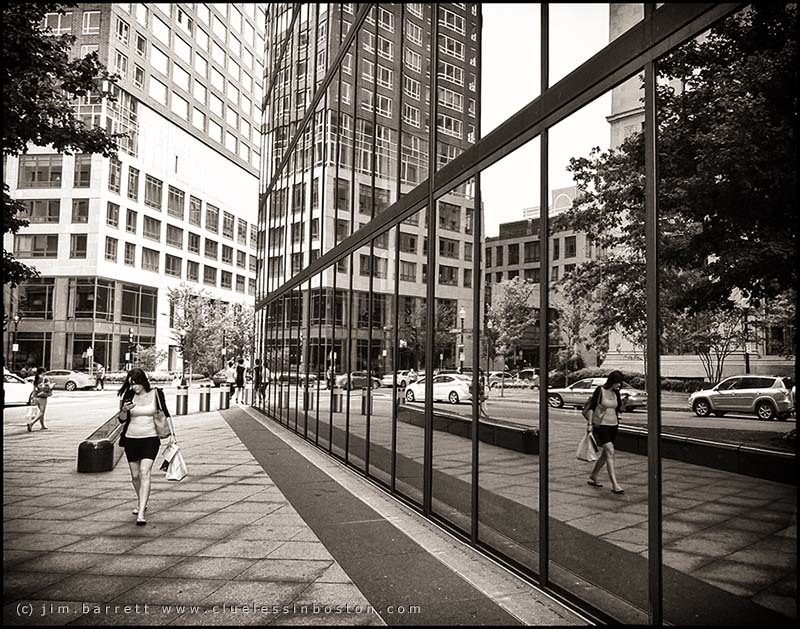 The composition with the reflections and converging lines gives the appearance of a duplicate world just beyond the glass. The monochrome is just perfect - color would have been to busy and interfered with your message. Very nice. Love the monochrome of this photo. Good composition to frame the reflection from the windows of the building. Where have you been? I miss your photos. Beautiful shot , perfect for B&W..